That quote is how I found myself here, on a boat traveling up the Tambopata River towards Camino Verde, a grassroots reforestation organization in the Peruvian Amazon. In my pocket, there is a small bottle of essential oil containing Moena Alcanfor, the scent that called me from San Francisco to this far-flung region of the world. I’ll be staying at Camino Verde for the next week to see for myself how this alluring botanical is sourced and distilled, and to learn more about the organization’s environmental work. The high sun beats down through a cloudless sky, so I still my body. The constant hum of the boat’s motor drowns out conversation, so I write in my field notebook. Coca leaves melt in my mouth, numbing the right side of my cheek. I smell that beloved and familiar verdant sweetness of the lowland tropics, comingling with the mineralic scent of moving water. I see the winding river, the muddy banks, the jewel green canopy stretching for miles ahead of us. Sheri, my travel companion, balances in the back of the boat as she films Robin Van Loon, founder of Camino Verde, and Ursula Leyva, Camino Verde’s director, talking about the day’s schedule. This afternoon we’re going to visit don Salomon, a neighbor and fellow farmer, to trade seedlings. Robin and Ursula make this trip several times a week as part of their community building efforts. Through these efforts, they hope local small-scale farmers will feel less isolated and marginalized, and thus, better supported to help mitigate the rampant deforestation devastating this region. Current forest loss data for the Peruvian Amazon estimates that 1.8 million hectares were lost between 2001 and 2015 – about the size of New Jersey, for perspective. The primary culprits for this staggering loss include conversion of forest to cropland, establishing cattle pastures, and gold mining. Small-scale agriculture represents one significant driver of deforestation partly due to the proliferation of monocultures such as papaya, cacao, and oil palm plantations– crops that provide the rural poor with a relatively lucrative and reliable source of income. This point underscores why successful conservation plans need to target smaller farms, but it also stresses the necessity of meeting the needs of over one billion people who depend on the rainforest for their livelihoods. Conservation must lead with compassion. I was aware of the myriad of ways in which conservation initiatives can fail from my studies in tropical ecology, as I focused my thesis work on the environmentally catastrophic spread of oil palm monocultures in Malaysia. I’ll never forget the sight of oil palm plantations viewed from the window of my plane as it flew over them. The perfectly uniform green rows created stripes beyond the horizon, where there was once a lush and endless jungle. In that moment, I was shaken to the core at what conservation failure looks like and what consequences it represents for every living thing on this planet: from the countless species, humans included, who had called that rainforest home to the global impact this wide scale deforestation would have on climate change. It remains the most heartbreaking and infuriating thing I’ve ever witnessed to this day. I demanded answers – how had humanity let this happen? What could we all have done differently? There are no simple answers to those questions but there are some solutions. I was first inspired by a conservation success story when I interviewed Noga Shanee, a primate researcher working in Peru, for Mongabay.com in 2014. Through the lens of a marginalized group known as campesinos, an impoverished, migrant population of farmers struggling in direct competition for resources and space with the critically endangered yellow-tailed woolly monkey, Shanee observed how conservation efforts were demonstrably impactful when they acknowledged the economic, social, and environmental pressures faced by the communities living within the threatened forests. In her view, conservation should originate and be implemented at the local level. For those reasons, in 2016, when I reached out to Robin to learn how the essential oil of Moena Alcanfor was being incorporated into conservation strategies, it was important for me to understand the role, if any, of forest dependent people in his organization’s work. Robin impressed and surprised with me with his answers – his vision for conservation began with the belief that empowering farmers to diversify their revenue sources to include a range of non-timber forest products, such as essential oils, would allow them to rely less on producing ecologically damaging goods. Since founding Camino Verde in 2006, Robin’s belief in the ability of farmers and landowners to lead the restoration of the Peruvian Amazon hasn’t shaken. Our visit later this afternoon to don Salomon’s farm was one such example of how Camino Verde’s collaborations with neighboring farms fostered greater stewardship of the forest. But first, we were headed to Camino Verde’s reforestation center and headquarters. The dogs sprint from the forest clearing as our boat pulled up to shore. Skinny and small, one was hairless; their breed was simply ‘dog.’ The spotted one jumps onto the boat and sniffs everything – the plastic bins filled with clean laundry, the tanks of gasoline, my muddy luggage. The distance from shore to the main house is a short walk along a tree-lined path. As we draw near, the sounds of barking dogs give way to the faint clucking of chickens and the low frequencies of women quietly conversing. A heady and fragrant smoke lingers in the humid air. I spot two women tending to a fire above which an enormous metal cauldron filled to the brim with what appears to be peanuts are roasting. "Those are related to cacao," says Robin. "Are we going to be eating them?" I ask. "Definitely!" he says. Our journey from Puerto Maldonado has taken hours and we’re all famished. We head to the kitchen for lunch. Augusto, a volunteer at Camino Verde, caught a fish in the river this morning, known locally as “Ashara” and scientifically as Leiarius marmoratus. Joel, one of the builders, is famous around these parts for his ceviche and he made a masterpiece of Augusto’s catch. The delicious ceviche is served with side dishes prepared by Camino Verde’s chef, donna Marciela – a feast of cassava, rice and beans, and fresh star fruit juice. Ursula, who has a vast and impressive knowledge of Amazonian botanical medicines, brews a spicy and sweet tea made from Canelón tree bark. As I sip my tea, Robin retrieves a piece of the Canelón bark from the pantry and scrapes it a few times with his pocketknife before handing it to me. “Smell this,” he says. I inhale the scent – it is like nothing I’ve ever smelled before, and yet it’s familiar – the scent of cinnamon and flannel, fresh yet warm, woodsy and soft. It reminds me of Christmas and makes me smile. Ursula suggests I taste it and I do. It’s naturally sweet, which explains why the tea is so flavorsome on its own. Aniba canelilla, or Canelón, translates roughly to “wild cinnamon,” and is a therapeutic herb widely used throughout native communities to treat flu symptoms; its natural warmth believed to ward off colds. 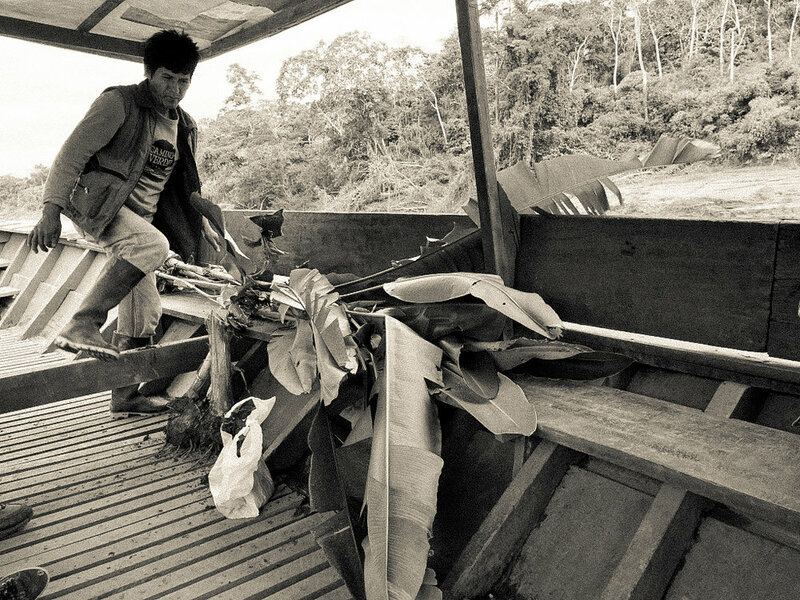 In addition to Canelón’s medicinal usage, the tree’s high abundance of aromatic compounds makes for rot-resistant wood; consequently, it’s a highly sought after and overexploited timber used for home construction in the rainforest. It’s rare to find wild Canelón seedlings in the forest given the lack of mature trees, so Robin and his team began collecting seeds and nurturing them in forest nurseries along with other seeds from useful and endangered native trees. The nursery currently produces over 20,000 seedlings per year representing over 100 species, which are eventually planted into forests that were once clearcut for agriculture, ranching, and gold mining. Camino Verde plants many of the seedlings on their own lands but they also donate them to local farmers like don Salomon to plant into their agroforestry systems. This is how Camino Verde is helping to reforest the Amazon. I ask Robin how the trees are then protected after planting – if they were cut down once, why not cut them down again? He explains that the key to the success of this conservation model relies on the production of and connection to markets for non-timber forest products (NTFPs) such as fruits, medicines, craft materials, and essential oils. When farmers profit from NTFPs, they are incentivized to protect the trees that provide them. "Where we need conservationists the most is in the tropics, and specifically, farmers in the tropics. Farmers could save us all," Robin says. "And farmers here can't just do things out of the goodness of their hearts, they need a monetary incentive." In Tambopata, this model has worked sufficiently well for Brazil nut trees, another high-valuable timber species that has been protected through the establishment of government-granted forest concessions. Many small farmers here hold such forest concessions, large tracts of mostly primary forest from which the sustainable harvest of wild Brazil nuts are permitted. 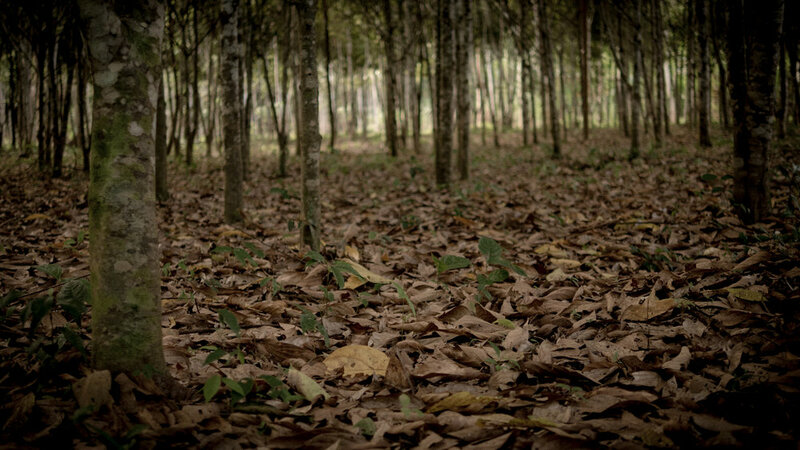 In Peru, it is illegal to cut down Brazil nut trees. Robin hopes to eventually convince the government to create concessions for Canelón, Moena Alcanfor, and other essential oil producing trees that would otherwise be felled for timber. However, even without the government’s mandated protection, essential oils could provide farmers with a valuable supplemental income that incentivizes the conservation of the trees. Manuel Huinga, Camino Verde’s Forestry Coordinator and field technician, is leading Camino Verde’s efforts to test this conversation model. He’s working to develop a sustainable wild harvest protocol for Canelón that includes planting more of the trees and selectively picking leaves and branches for essential oil production. After lunch, Robin, Ursula, Sheri and I walk to one of the reforestation sites where hundreds of different species are growing. We meander through the trees, stopping from time to time when Robin uses his machete to hack off a piece of tree bark for me to sniff or pulls off a leaf and crushes it in his palm for me to sniff, or nicks a tree trunk to watch the resin ooze out. He shows me a “Dragon’s Blood” tree – it weeps with a blood-like substance that is useful for healing cuts. I spot a relative of Moena Alcanfor that smells like avocado, and a palm tree with yellow flowers that Robin says smells heavenly but only sometimes. I can’t smell anything. Although we’re not in the primary forest, I’m amazed by the diversity and richness of this system and wonder what it was like before Robin and his team began to plant here. Robin explains, “I believe this was once a plantain farm. The previous owner farmed in the semi-migratory farming pattern that is really common here. And it’s usually slash and burn – you clear a hectare or maybe two, you plant your corn, you plant your bananas, and you get a productive life off of the piece of land for maybe a couple of years. But the soils here are so fragile that it can take eight to 20 years of fallow (secondary forest) to regenerate the soil to the point where it can support another crop. So part of the aim of an agroforestry system in a place that was previously degraded by smallscale agriculture is to regenerate the soil and we certainly see that here." Whereas "primary forests" is a term used to describe forests that have never been degraded, "secondary forests" or "regenerating forests" (known locally as purma) are the terms used to describe lands that were cleared for some purpose and then, as Robin described, are left to grow back. Not all purma, however, is equal. Some regenerating lands are still healthy enough to show signs of recovery relatively quickly, while others used for more intense activities, like gold mining, contain soils contaminated by heavy metals. It's difficult for new life to gain a foothold in toxic soils but Robin and his team have successfully demonstrated how native trees like the ones grown in Camino Verde's nurseries are well suited for overcoming the challenge. Their sturdy roots are capable of surviving in polluted soils; the seedlings grow strong, transforming a barren wasteland back into a jungle. As I take another look at my surroundings, I find it hard to believe that this land was once used for a plantation. I remember the oil palm plantations in Malaysia, the oppressive heat without the presence of a shady and protective canopy above, the scourge of mosquitos in the absence of competition, the almost eerie dearth of birds. This vibrant landscape doesn't seem to hold any memories of such devastation. I hope the same can be said for the future sites of abandoned oil palm plantations. There will be many. It's time to leave this tranquil forest and head back to the house. Don Salomon awaits and the day is already drawing to a close. There is nothing quite like sleeping in a rainforest – I wish everyone could experience it as least once. I fall asleep gazing through the meshed walls of my bedroom and across the moonlit treetops, calmed by the rush of gently falling rain. When I wake up, it's six in the morning. The sun is already bright but the air is pleasantly cool. I throw a sweatshirt over my pajamas and head out towards the reforestation site from yesterday. I record some bird songs with my field recorder while I wait to hear the sound of donna Marciela's breakfast bell ringing. The diversity of bird song in the early morning is staggering; I can discern at least a dozen different calls but I don't know where they're all coming from. The canopy is wild with bursts of colors and rustling. Flocks shoot across the sky in formation and disappear below the treeline. I nearly miss the breakfast bell from the cacophony of trills and squawks, chirps and whistles. After breakfast, Sheri, Robin, Ursula, and I hike out to one of the Moena groves. It's smaller than I had expected; this grove represents the largest reforestation of Moena in the world and yet it doesn't feel out of place with the surrounding environment. The groudcover is thick with dead leaves and Moena seedlings sprout through here and there. The trees are handsome, with glossy leaves and mossy trunks. I can tell how proud both Robin and Ursula are of this accomplishment. I point out some mushrooms peeping through the leaf litter and ask Robin about this forest's ecology. "There's an interesting mycology going on here – at certain times of the year the forest ground is covered in mushrooms, and it's also an amazing habitat for bats. In the nearby primary forest, bats are on the run from predatory owls, so the bats bring large, seeded fruits from the primary forest and they come here to perch and eat them in safety. Then they drop the seeds. This is a meaningful demonstration of how we can accelerate the process of regeneration. Here you get a similar functioning of a secondary forest but in a system that also benefits the person that is caring for it. This is an active stewardship," says Robin. As we walk around the Moena grove, Ursula explains the details of the harvest that will happen later this afternoon. The lateral branches and leaves will be lightly and selectively pruned in manner that benefits the health and growth of the trees. They only take what they need from which to extract limited quanties of essential oil at a time. I'm relieved to hear this and am also eager to see and smell the distillation process in person. Ursula tells Sheri and I that we'll be spending the afternoon with don Juan, a Peruvian farmer who officially joined Camino Verde's team in 2014 as its head distiller and caretaker of the Moena groves. Juan has his own agroforesty orchard across the Tambopata River where he grows an abundance of fruits, but after witnessing the value of Moena for himself, he decided to plant a similar "aroma forest" on his land. It will take two to three years before he's able to prune his Moena trees for essential oil distillation. He looks forward to the supplemental income because it will allow him to hire on more workers at his growing farm. We return to the house for yet another delicious lunch cooked by donna Marciela – this time the kitchen table overflows with bowls of stewed lentils, rice, salad, and fried farm eggs. The egg yolk is so orange it reminds me of a California sunset. I notice that fresh fruit juices are always being pressed in this kitchen – star fruits, papayas, coconuts, bananas – and teas of forest herbs are constantly brewing. You could never go hungry or thirsty here, and to that point, Robin reminds me that there is no word for "famine" in this region. The forests are so rich and generous it seems impossible to imagine their resources would run out. At times, this optimism can be a barrier to changing attitudes about the necessity of conservation. After lunch, Sheri and I join don Juan in the Moena grove to watch the harvest from the trees and the distillation of its essential oil. I'm so excited to finally get the chance to see how this intoxicating scent is made, it's something I've been wondering about since the tiny bottle of Moena first arrived in my mailbox in San Francisco. Don Juan begins by prudently selecting the branches to prune from the trees. He places the branches into a wheelbarrel and carries the load back to the distillation site, near the house. The branches are cut down and fed into a woodchipper, the pulp is packed into a stainless steel barrel on top of a low flame. Don Juan assembles the distillation apparatus to the barrel and within an hour, the pulp is heated up enough to start producing essential oil and its byproduct, hydrosol, which is collected into a bucket. As the hydrosol slowly drips into the bucket, I cup some into my palm and inhale it – it has the scent of freshly brewed oolong tea, similar to the oil but lighter and sweeter. I rub some of the hydrosol onto my arms and I can't believe the cooling and softening effect it has on my skin. It's blissful. I wonder if I can drink it. I ask don Juan. He says no, but I could bathe in it, as many of the locals apparently do. The whole process takes several hours before even the tiniest amount of essential oil is extracted. Don Juan meticulously drizzles the precious and fragrant liquid into the same one liter bottle he's been adding to for many extractions now. I wonder how many more times he'll have to go through this process before the bottle is finally full. He brings the bottle over to me with the kind of caution and care one would reserve for the transport of a human heart. He places the bottle in my hands and I lower my nose to the opening and breathe deeply the scent of the rainforest itself – of plants sweating in the morning sun, the fragrance of young ginger sweeping through the green canopy, notes of brewed tea and fresh tobacco leaves, oncoming thunderstorms and the crispness that follows. There is nothing else like it. Don Juan sees my appreciation, smiles, and nods. "Beautiful perfume," he says. I couldn't agree more. A portion of the proceeds from sales of Moena 12|69 will be returned to Camino Verde to contribute to their important work. You can also make a donation directly to them here. Camino Verde produces only a limited quanity of essential oils and so they are primarily a donor-funded organization that relies on people's generosity to make thier magic happen. Every little bit helps. Thank you.